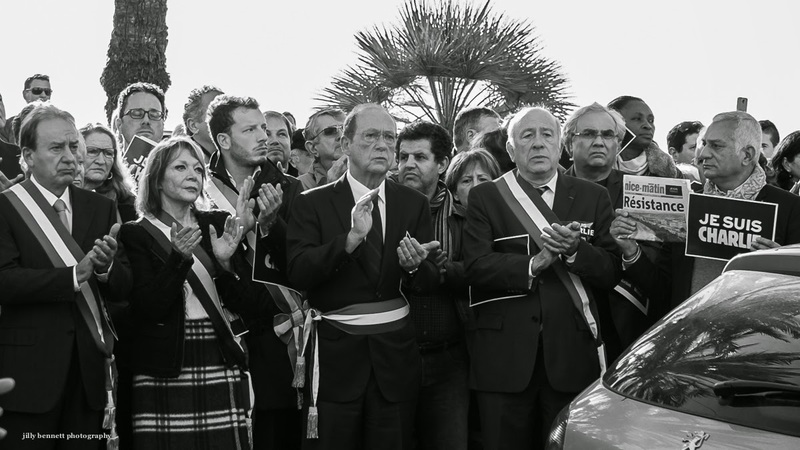 The procession of 8,000 people made 4 stops on its way through the centre of Menton: the police station, France 3, the synagogue and Nice-Matin, each time holding a minutes silence and then clapping to honour the journalists, police and members of the Jewish community killed in Paris. 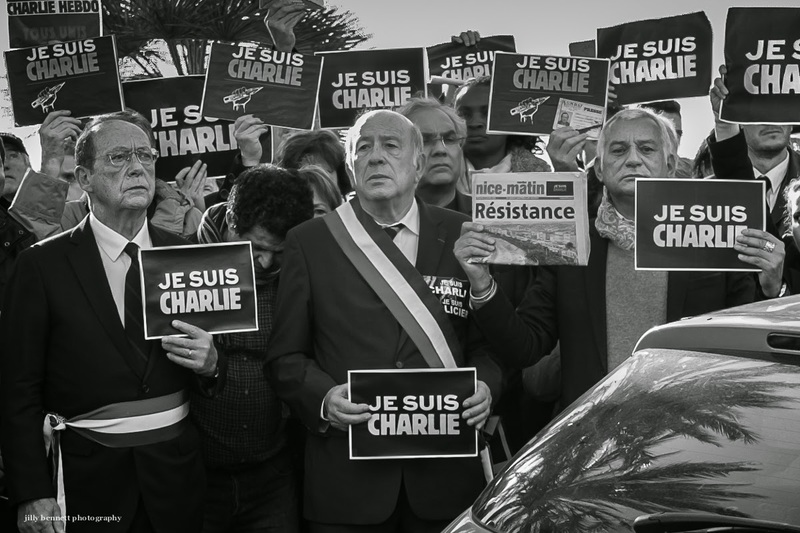 In this photo, the dignitaries are standing in front of the offices of the local newspaper, Nice-Matin, as they hold a minute's silence. Le cortège de 8.000 personnes a fait 4 arrêts durant son parcours à travers la ville de Menton: le Commissariat de police, France 3 Télévision, la Synagogue et Nice-Matin, observant chaque fois une minute de silence suivie d' applaudissements pour honorer les journalistes, la police et les membres de la communauté juive tués à Paris. Sur cette photo, les dignitaires sont debout devant le bureau du journal local Nice-Matin , observant une minute de silence. Once again, your photos have brought tears to my eyes, Jilly. I wish it was for another wedding. The solidarity these horrible attacks has produced, so beautifully expressed in your photos, is encouraging though. Too often, people who have little experience with tolerance perceive it as weakness. This past week has proved just how strong it can be, and how determined we all are to defend it. There is great strength in both of these shots, Jilly. When New York's Twin Towers were attacked, we had a wake-up call that no one was expecting. Initially, the solidarity here in the USA was heart-filling. But we are so divided now. My fervent hope is that the world's solidarity is now indivisible, and that we are awake and will remain so, together.